Home » Uncategorized » How to stay healthy on cruise ships. How to stay healthy on cruise ships. Although the vast majority of cruisers stay healthy and have a wonderful time on their cruise, cruise ships are mini cities where thousands of people live in close quarters. And since many of those passengers come from different parts of the world, cruisers are exposed to lots of different germs and bacteria on board. 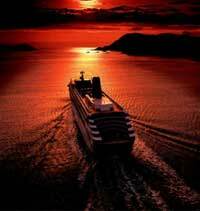 Most cruises go off without a hitch. But occasionally, a ship will have an outbreak of a norovirus, also known as the Norwalk virus. Since the Centers for Disease Control tracks outbreaks on cruise ships and not at land-based resorts, it’s hard to know if they’re more common on cruise ships or just reported more often. Sometimes mistaken for the stomach flu, the Norwalk virus is extremely contagious. It’s spread through contact with someone who has the virus, or by touching something they have touched and then touching your mouth or nose. Symptoms of the virus include diarrhea and vomiting and sometimes a headache and mild fever. It can last for several days. But you can be contagious for much longer. It can’t be treated with drugs. Once you have it, the best thing to do is try to stay hydrated. The clinic on your ship will be able to give you rehydration fluid if you need it. The best thing is to keep from getting infected in the first place. You’ve probably heard or read about cruise ships where hundreds of people were sickened. But that means that hundreds, maybe thousands more stayed healthy. The top tip for avoided the Norwalk virus is to wash your hands often, and to avoid touching your face. Many cruise ships now have hand-sanitizer located throughout the ship, especially at the entrance to restaurants or buffet areas. Use these, but don’t rely on them completely. Nothing takes the place of thoroughly washing your hands for a couple of minutes with hot, soapy water. Since bacteria can often be in foods, avoid raw shellfish, and make sure raw fruits and vegetables have been thoroughly washed — especially if the ship was provisioned in a third-world country. And it’s not a bad idea to stick to bottled water. Some evidence suggests that drinking wine can reduce the likelihood that you’ll contract a norovirus. If that’s something you enjoy anyway, bottoms up.